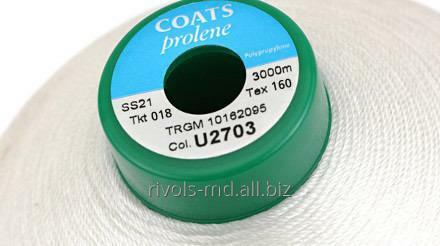 Coats Prolene is a thread from complex threads for polypropylene sewing. The product provides excellent resistance to acids, alkaline materials and solvents, and also hydrolytic firmness to 90 °C. Because of the special greasing, Coats Prolene provides good sewing of filters, production bags and a set of other technical accessories. Coats Prolene has excellent resistance to acids, alkaline materials and solvents. It also has good hydrolytic firmness to 90 °, and good execution of sewing. Coats Helios P is the hi-tech sewing thread executed from 100 politetraftoretilen (PTFE), possessing magnificent resistance to chemical influence and influence of UF of beams. Coats Gral - the complex polyester thread processed by greasing excellently suitable for tailoring, products of skin, sports goods and many other products. Coats Firefly is the shtapelny thread from 100% of meta-aramide fiber providing magnificent protection against heat and an open flame with temperature to 371ºC. In view of the fact that the possibility of application of this or that thread more depends on conditions of final application of a finished product, the customer should hold preliminary testing to be convinced that the picked-up thread applicable for this type of a product. The technical information given above is based on average values and can be used only as approximate. Unbelievable price on Propilenovy thread for industrial bags of Coats Prolene in Chişinău (Moldova) company Rivols, SRL.